Plaut IT Australia is one of the largest locally owned providers of on-premise and cloud SAP solutions in the ANZ region with a national staff of over 150 people. The Plaut IT Australia website needed a design refresh. Plaut wanted the new design to have more of a ‘contemporary feel’ and to bring attention to the wide range of services they offer. The company targets the corporate market and the website needed to have a clear & clean design that conveyed a sense of professionalism. The design should also strongly convey the companies brand. The website also needed to be better equipped to capture potential leads and needed to be responsive so that website visitors using mobile/tablet devices didn’t leave the website out of frustration. We provided a complete redesign from the ground up sticking closely to the provided brand book. 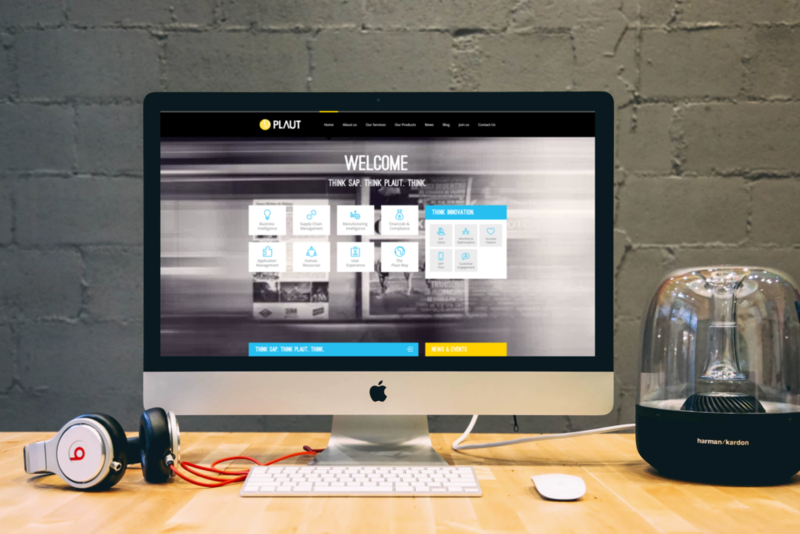 The new website focuses on drawing attention to the services or ‘solutions’ offered by Plaut with the end goal of informing potential customers and generating relevant leads through custom lead-gen forms. A robust blogging platform with lead-gen forms was also provided with the inclusion of an event management system for the hosting of corporate events. Custom content management system interfaces were included for team/staff management as well as client testimonial management. The website was connected to the JobAdder HR system so that the HR department can easily manage career opportunities on the website. Continual website care has been carried out since the inception of the new Plaut website, focusing on performance and search engine optimisation. Training and assistance in managing the content of the website is consistently carried out so that staff members can control content. The Plaut IT Australia website has been a massive success, drawing in an average of over 2000 page views daily. It continues to generate leads and continually inform customers with new content. Plaut’s search engine ranking for key targetted keywords and keyphrases is monitored daily and reported on, allowing us to adjust the SEO strategy, ensuring that the website continues to climb through the rankings. Check out the testimonial below from Plaut IT Australia! Ryan has undertaken a range of web development, email automation, animation and design work for our business. Ryan has a professional consultative manner and always delivers excellent outcomes for our brand and our online presence.